through advanced laser and computer technology. Neurological Stress Reduction Therapy (NSRT), including the use of the BAX Aura laser treatment, is rooted in reducing stress in a patient’s body. According to the AMA, stress causes or contributes to 80 – 85% of all human illness. When individuals are exposed to potential substances (often referred to as allergens) while undergoing stressful situations, an association can be formed in which the body can react to those substances as harmful in the future. To break the negative association the body has created, NSRT introduces positive stimulus into the equation, one of which is the laser component of the treatment. NSRT utilizes nutrition, homeopathic, modernized elements of acupuncture, kinesiology, and cutting edge computer and laser technology to strengthen the immune system, increase core energy, support healthy and natural detoxification processes while restoring balance to the body. The digital library of the Bax Aura, where the frequencies of actual substances are stored in digitized form, is a tremendous tool used to specify protocol for each individual. This digital library consists of foods, environmental substances such as weeds and mold, pet hair and dander, toxins, and much more. With skin level readings of sensitivity to these substances, in addition to a patients history, family history, current symptoms and experiences determine the best options for a patients restoration to optimal health. With the BAX Aura, patients can undergo a meridian and stress assessment (MESA) without the use of needles or blood tests. With NSRT and the BAX Aura, patients can undergo evaluations without needles or blood tests, since potential stressors are introduced to the patients through a fully automated and computerized Meridian and Energy Stress Assessment (MESA). 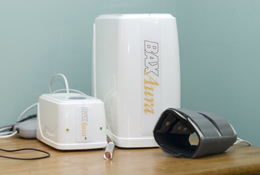 Once a patient’s skin reactions are identified, one component of care may include the use of the BAX Aura Low Level Light Therapy (LLLT) to reduce stress on the nervous system and its response the areas of sensitivity. 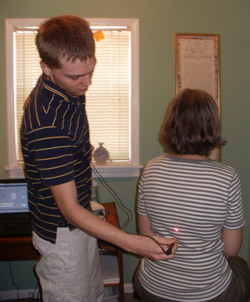 To do this, the laser system takes the electronic version of a patient’s sensitivity, which is stored in its computerized data base, and introduces the patient to that substance while he or she is simultaneously receiving beneficial stimulus from the cold laser. A positive association is created in which the body safely receives the frequency of the substance in combination with the positive, healing effects of the cold laser, thus reducing the stress on a patient’s immune system response, allowing the body to more safely accept the substance in the future. Most often, nutritional and homeopathic recommendations are also given so that a patient can continue their path to balance and functional support beyond the treatment with the Bax Aura. NSRT and the BAX Aura help identify, reduce and potentially eliminate stressors which may contribute to a host of symptoms. What makes our therapy highly unique is the integrated use of Low Level Light Therapy. At BioVeda, we use light as a carrier medium to induct digital frequencies and information the body can use to restore balance. We utilize red, green and far-infrared to provide the traditional benefits of light therapy such as increased circulation, healing and general reduction of pain and inflammation. We present the light on the appropriate acupoints to redirect the flow of energy, reduce substance specific stress and bring the body back to balance. In addition to light therapy, the AURA integrates harmonic imprinting. This allows the practitioner to fortify homeopathy with additional information further customizing the therapy to each patient. The homeopathy in this phase is used to support organ and system function as well as promoting detoxification to further the energy balancing process. in both physical and emotional health.